Have the Feds left the building on the bio-economy file? 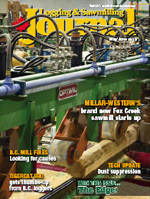 The recent words and actions of the Harper Government should be cause for concern within the Canadian forest industry. That’s because the future of the industry in the global market hinges upon a positive environmental message. When it comes to matters of the environment, Stephen Harper and his Cabinet have certainly been sending many mixed signals lately. While the forest industry has had its challenges with environmental lobby groups, there’s no denying that the future of the industry beyond framing lumber, pulp and paper, and panelboards is in bio-products. The Canadian forest industry, even in partnership with the federal government in many instances, has spent millions over the past decade promoting a strong ‘sustainable and renewable’ message as far as more wood use and bio-product development is concerned. That’s the future of the industry on the global stage, and it’s part of the marketing advantage the industry has worked hard to develop. However, as is quite common with large ‘C’ conservative governments, they tend to gamble their fortunes on a few perceived winners and then lobby with all they can muster to become a vocal cheerleader for those sectors, hoping that jobs will follow, leading to future election victories. While it denies any such posture, it would take a trapped Peruvian coal miner not to notice how vocally the Harper government has been leading the oil and gas brass band ever since winning a majority government. Recent frontal attacks on the environmental movement, even going so far as to threaten to sic Revenue Canada on such organizations as the David Suzuki Foundation for its political activism as well as new legislation that will allow for fast tracking of pipeline and oilsands projects, only add more fossil fuel to the fire. I suspect that the major push to support the Keystone Pipeline to carry Alberta crude to the southern United States and the Northern Gateway pipeline to carry more crude to the West Coast and then to Asia is simply Harper showing his pragmatism, knowing that he has three to four years of real power to make these projects a reality without the encumbrance of opposition political parties biting at his heels. If all goes according to plan, the pipeline projects will ignite another massive oil boom, resulting in many new, high paying jobs. In addition to opting for jobs now at the expense of a livable world later, another oil boom will challenge the forest industry—especially in Western Canada—to keep and attract skilled workers, especially with an aging population where experienced and skilled workers are retiring. However, here’s an example of where the federal government is sending mixed messages. It seems to be fueling the fires of another massive oil boom, but at the same time, it is bringing in positive legislation such as reducing the amount of employment insurance that the unemployed can collect in areas of chronic unemployment. The idea is to encourage the chronically unemployed to move to areas where jobs are available. That is a great idea and should help to reduce labor shortages, but I’m not sure it will be enough to quell the competition for skilled labor. The Prime Minister is also traveling the globe, attending any meeting that will have him, and lobbying skillfully for a seat at the table for the proposed Trans-Pacific Partnership, which is an evolving organization aimed at facilitating easier trade among countries like the United States, Australia, New Zealand, and several countries in Asia, including China. Bravo! Harper is doing exactly what few before him have done well, which is to promote Canada’s resource industries to as wide an audience as possible. Back home, the federal budget recently maintained the government’s contribution to FPInnovations, Canada’s forest products research institute, which was a major score for the forest industry at a time when major cuts are occurring at the federal level. So it’s puzzling. Given the federal government’s recent actions, I believe it would be worthwhile for organizations like the Forest Products Association of Canada (FPAC) to meet with federal Department of Natural Resources Minister, Joe Oliver, and ask him point blank: where does the forest industry stand insofar as the federal cabinet is concerned? What is the future for funding R & D for the pursuit of bio-products by the forest industry?